One of the songs recorded during the Black And White 050505 sessions, this Sean Kelly composed piece was radically different from the rest of the material being written during that period. Exclusively premiered on the Billy Sloan show (9th August 2005), it was suggested that it was a B-side of the forthcoming single (which it wasn't). It subsequently became the first song from the period to be released, appearing on iTunes (UK only) as a official download a week before the Home single. Exclusive artwork was also prepared for it. Both Jim and Sean Kelly sang on the recording; one of the view times the band have recorded with two vocalists. SK: Watching all the time. SK: 'Cause my Daddy got me up to watch it on the TV. SK: There some faces I know better than my own - I haven’t even met them. SK: I watch too much television. SK: Another piece of history sprayed through the back of my eyeballs. SK: Another chunk of the universe bounced into my retina. SK: From The Beatles, to bombs, birds, stats, cornflakes, über models, governments, starvation, battleships, cartoons, "Drink Beer", "Eat This" "Drive That", "Buy This" - it's a polyunsaturated shampoo whitewash. SK: I love watching television. JK: Walking through the sleep. JK: Nothing's what it seems. JK: Someone's in the ???. JK: There's nothing there at all. SK: I can feel it flowing through the ceiling. SK: I can feel it dripping out the sockets. SK: I can feel it change the way I'm feeling. 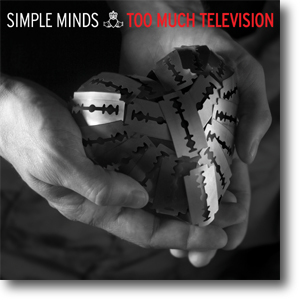 Arranged by: Jez Coad and Simple Minds.